The fact of the matter is, with a handful of exceptions, Republicans are the party of life, the Democrats the party of death. Control of the House and Senate, if it is going to remain under the stewardship of pro-lifers, will be because Republicans remain in the majority. With that truism in mind, what do we know five days away from the pivotal November 6 midterm elections? We know that the party holding the White House traditionally loses seats in the House of Representatives the first midterm after their candidate wins. Democrats need to flip 24 seats in 2018 to win control. Besides wish-fulfillment and bottomless hatred of President Trump, the reason the major media have predicted a “Blue Wave” for a year is that, generally, the lower a president’s approval ratings, the more seats his party loses. This misses several factors, including that President Trump’s approval numbers have crept up and that he has been campaigning for Republican candidates for months. As Sally Persons of Real Clear Politics wrote recently, “In Texas, for example, Trump’s massive rally last week had people standing in line over a day in advance to ensure they would get in”. This outpouring of support is visible at all of Trump’s rallies. That’s why it is so important that yesterday the President commenced an eight-state campaign blitz. There will be polls on top of polls on top of polls in these last few days. When a candidate (almost always the pro-life candidate)who has been steadily gaining ground suddenly is said to be a number of points behind, you know it’s simply not true. But that non-truth will be used as the basis of global generalizations, the intent of which is to discourage pro-lifers and conservatives from voting. Don’t believe the propaganda intended to dampen your and your family’s enthusiasiasm. There are states where there is every evidence (including early voting tabulations) that the turnout will be very high. We are supposed to be intimidated—high turnout means more younger (read Democratic) voters. But…. Republicans have done their homework in attracting younger voters. And we will see whether categories of Republican-leaning voters who traditionally vote in midterms do so in their customary large numbers or, as I strongly suspect, come out in force. There are issues that are favorable to each party. But one staple of elections past is the better the economy, the better for the party in power. And the economy is humming. How? One key component is texting. Let’s be clear. As we talked about above, the party in power tends to lose seats in the House the first midterm after its candidate is elected President. But the size varies enormously. If we know anything about 2018, it is that President Trump is a genuinely unique political figure and that victory for pro-life candidates across the country depends in part on a large turnout of committed pro-lifers. 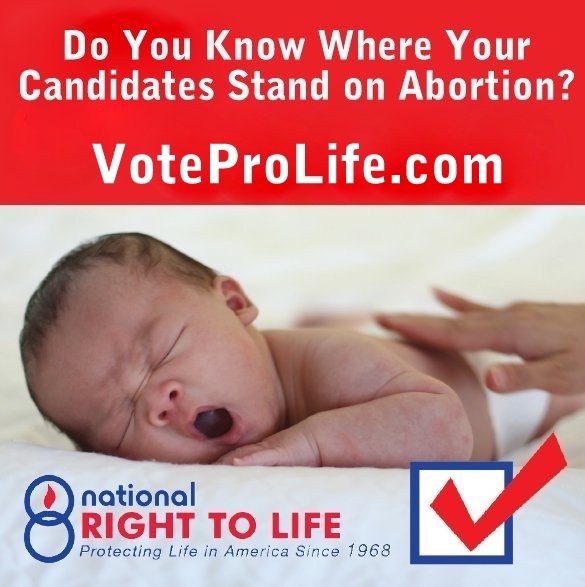 Before you vote, be sure to go to www.voteprolife.com and click on the menu “Pro-Life Candidates.” Click on your state for a downloadable list of pro-life gubernatorial and federal candidates. For your state and local candidates, contact your state affiliate. You can find information for them at nrlc.org. Do I need to say the stakes could not be higher? No, I’m sure I don’t.